Spend a full day by the seashore at scenic, sprawling Folly Beach County Park. This expansive park which takes up the entire portion of the southwestern end of Folly Beach features plenty of room for multiple towels and umbrellas, with well over 3,500' feet of ocean frontage, and 200' feet on the opposite side of the island along adjacent Folly River.An easy-to-access and easy-to-enjoy stretch of sand that features anything a beach lover could possibly need on a long, lazy outdoor vacation day, a visit to this Charleston County Park is, quite literally, a day at the beach. Accessing the park is a fairly simple venture. Travelers need only take route 171 across the Folly River, and head southwest along the "main road," West Ashley Avenue, until the road digresses into an unpaved but easy-to-travel stretch of hard-packed dirt and sand that borders the park's borders. 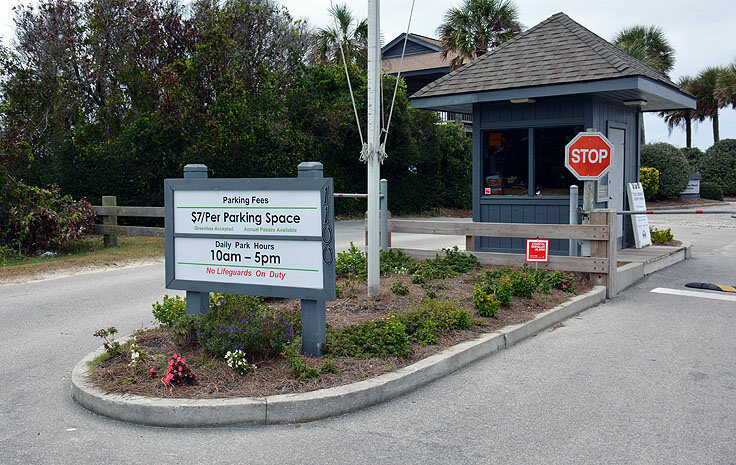 There's ample parking here, which is only occasionally limited on busy summer days, all along the Folly Beach County Park road, and all parking spaces are just a hop, skip, and a jump away from the ocean itself. Towards the river, visitors can peer past acres of marshy flatlands to the far away waterfront western borders, but the real attraction is just over the low-lying sand dunes, under the lines of Palmetto trees. The ocean-facing beach here, all 3,500' feet of it, is sunny and wide, with a flat bottom that makes wading, splashing, and boogie boarding a breeze. The beach narrows significantly during high tide, but even in the height of summer, there's generally plenty of room to set up camp, if not adjacent to the park's entrance itself, then just a short trek along the beach which gets less populated the further south you go. Visitors who like a little privacy on a lazy beach day are advised to head southwest, far from the park's entrance, for the best, uncrowded stretched of shoreline. The "boardwalk" is one of the most photographed landmarks within the park, and is a long wooded stairway that starts at the edge of the dune line, and extends well up into the air before tapering downward towards the sand, (and sometimes, during an extreme high tide, towards the water.) A great place for sprawling Folly Beach and inlet views, visitors who climb up the boardwalk should have a camera in hand to capture the incredible ocean to river vistas in all directions. The park is open year-round, and offers handicapped accessible restrooms and picnic areas with grills throughout all seasons. In the summertime hours of operation, (generally defined as daily from July to August, and on the weekends from Memorial Day to Mid-September), beach-goers will find a world of additional amenities at their disposal. 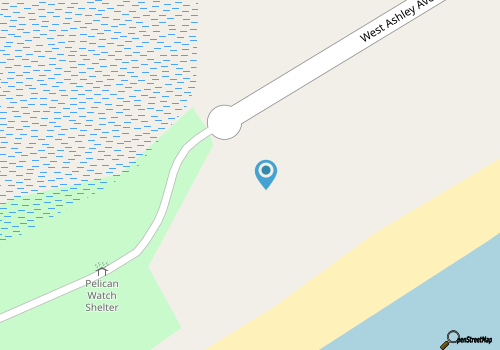 These services include lifeguarded beaches, outdoor showers, a full snack bar with shaded outdoor seating, a retail area, and beach chair and umbrella rentals on site. Folks who didn't bring their beach gear along can also rent chairs and umbrellas on site for around $10 per item per day. The parking area is free in January and February, and costs around $7 per day during the rest of the year, with slightly more expensive rates on summer weekends at around $10 per day. Campers and buses are charged a higher rate of around $20 per day or so, and both check and credit cards are accepted at the park. The good news is that the parking fee covers access to the beach for everyone in the vehicle, so visitors are encouraged to carpool when possible to both save money on park admittance, and to ensure there's plenty of parking to go around. 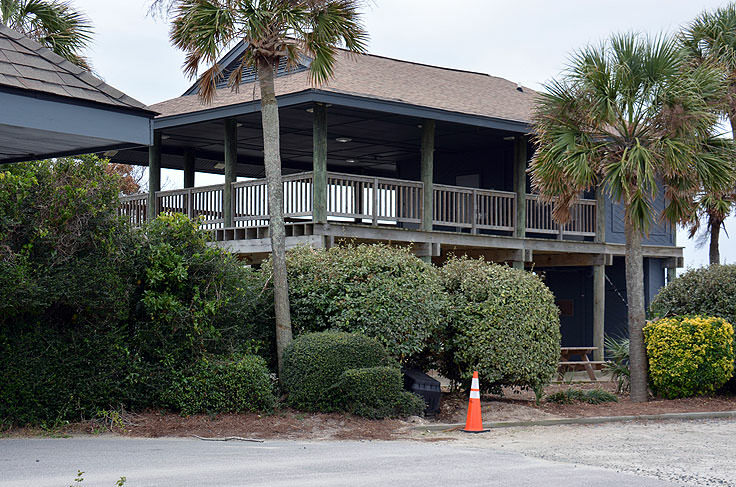 Just as rates can vary from month to month, the Folly Beach County Park also has seasonal hours of operation. From May until Labor Day, the park is open daily from 9:00 a.m. until 7:00 p.m. In the shoulder season spring and fall months, the park is open from 10:00 a.m. until 6:00 p.m., and in the winter months, is open daily from 10:00 a.m. until 5:00 p.m. For more information on the park's facilities, (including seasonal hours), contact the Charleston County Parks and Rec department directly at 843-588-2426. Folly Beach County Park, located on Folly Island and adjacent to both the Atlantic Ocean and Folly River, certainly does its island and river namesakes justice with gorgeous long beaches that allow everyone to take a quick trip to Folly Beach and admire the expansive shoreline. While the beach can get a little crowded in the summertime and on holiday weekends, and parking can be occasionally limited, this seashore is hard to beat in southeastern Charleston County, and is easily one of the best loved, and most visited county parks in the Lowcountry region. Bring the sunscreen, the kids, and all the beach gear along, (or just rent some on site), and discover why this stretch of sand is a great representation of gorgeous Folly Beach and the South Carolina coastline in general. Rainbow Row is a famous historical Charleston neighborhood that certainly lives up to its name. The collection of brightly-colored homes, which are stacked side by side, is arguably one of the most photographed sections of the city, and attracts dozens of artists who regularly set up easels around the East Bay Street neighborhood, and break out the watercolors or acrylics to capture the colorful scene. The seaside town of Folly Beach, and the barrier island of the same name, has a lot of lovingly applied nicknames from long-time locals and visitors alike. Known as "One of the last real American Beach towns," and "The Edge of America," this family-friendly destination features a world of outdoor fun, entertainment, shopping and dining, conveniently located around every sand dune.